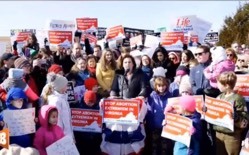 Alison Centofante of Live Action said the bill was quite radical, saying "75 percent of Americans reject abortion. They are for limiting abortion to the first trimester if not banning it outright. That includes 60 percent of Democrats." Video clips of Virginia Delegate Kathy Tran, who sponsored the bill, and Virginia Governor Ralph Northam defending the bill, went viral over the last few days. Virginian Denise Cappuccio told the rally crowd: "My husband and I just recently purchased a home in Delegate Tran's district. And I am one of her constituents. And when I heard about this legislation, my husband and I were completely appalled. And saying 'we have to do something.'" Tran admitted at a committee hearing the bill would allow the abortion of babies coming down the birth canal, seconds from birth. And Northam on a radio broadcast appeared to defend a part of the bill that would allow a baby who survived an abortion attempt to be given no medical aid and left to die. Northam suggested his remarks have been mischaracterized. "As for Governor Northam's role in all of this, he didn't confuse late-term abortion and infanticide. He views them as the same. He supports both and he is right on one thing. Both are morally equivalent. Both are murder," Victoria Cobb of the Family Foundation of Virginia said at the rally. Cobb also said of Northam, "As a candidate for governor, the abortion industry put nearly three million dollars into his campaign coffers. I warned Virginia then and I'm sorry to be standing here saying Northam is bought and paid for by the abortion industry." Olivia Gans Turner of the Virginia Society for Human Life said of that industry: "The reality is that the new ethos of the pro-abortion lobby is to go all in for abortion, under any circumstances at any time. It always has been since 1973. But now the cat is out of the bag. We are seeing the truth once and for all. The veil is pulled away and we are aware that even at nine months of pregnancy, these people believe it is legitimate." "The abortion lobby, Planned Parenthood, and their allies have a radical abortion agenda," added Tina Whittington, of Students for Life of America. "We just issued polling that showed of millennials, only seven percent approve ... accept ... this extreme view on abortion. And of those we polled, the majority—even those who consider themselves pro-choice—want to see limits on abortion." Whittington said of that agenda of abortion for any reason at any stage of pregnancy, "This is extreme. This is radical. And now is the time for us to be outraged." Marjorie Dannenfelser of the pro-life Susan B. Anthony List pointed out far too many people in positions of leadership and influence aren't fighting back. "If any elected officials and members of the media say nothing, you have said everything. Your silence speaks," she said. Pastors & Priests: Wake Up! Penny Nance, director of Concerned Women for America, added, "To all the pastors and priests in America who don't want to be 'political,' wake up! There is a cost to your silence. There is a cost to the unborn. There is a cost to your being quiet, and you will have to answer for that someday. The women of America will lead on this issue. We will not be silent. But we sure do wish the rest of you would join in." Janae Stracke, grassroots director of Heritage Action, said of politicians backing abortion, "They know they are not representing Americans. They are bought and paid for by the abortion industry. And what are they actually afraid of? They're afraid of the truth. They're afraid of science. They are afraid of Roe v. Wade being overturned." Nance concluded by saying it's time for pro-life Americans to fight harder than ever for the unborn: "Recognize where we are in this moment. We have to step forward and speak." She pointed out that one of the most radical abortion bills in history just passed the New York legislature because the state Senate recently flipped from a pro-life to a pro-choice majority. "So, for everybody that stayed home in 2017 and 2018 because you didn't like Donald Trump's tweets, wake up! Wake up!" Nance admonished voters.